Rain Alarm is an accurate free Weather App available for your Windows 8 and 8.1 computer. 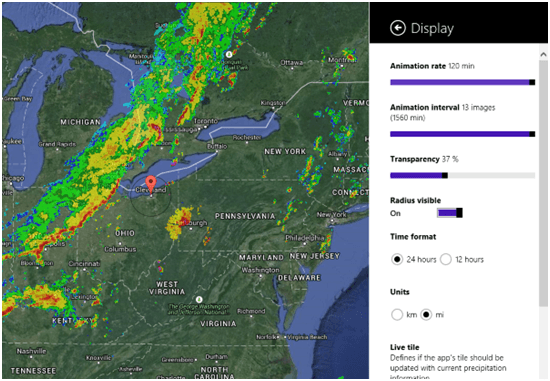 This weather app runs real time data of cloud and rain activity. It is capable of alerting you whenever rain is close to your location, as this wonderful weather app automatically detects your location. The alert appears on the computer screen, and you can also set audio alarm. This Rain Alarm app sets off the Alarm whenever rain is near to a chosen location. The search radius option lets you set a radius from the selected area, and the alarm triggers when the rain is about to reach that radius. You can easily change the Alarm settings, which let you alter the sensitivity, search interval, and audio notification. You can search for your location automatically, or manually. 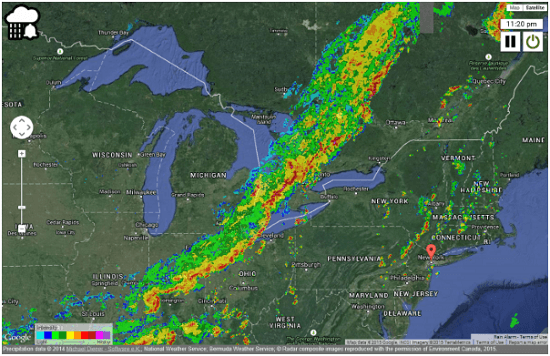 You can also easily drag across the map and locate a place and its real time precipitation details, more precisely. Switch between map and satellite views to view any location. The Rain Alarm app shows real time animated data for a defined period of time (animation rate). The animation rate can be selected from 30 minutes to 120 minutes. The animation interval, i.e. the number of frames of animations, can be changed as well. The animation interval varies from 2 images, to 13 images. An increased animation interval shows data for a longer duration, while low animation interval provides rain activity data for a short interval. Units to reflect the wind speed can be switched between miles per hour, and kilometers per hour. The cloud’s animation can be easily paused and back/forward option let you browse through paused cloud frames, anytime. The App tile of Rain Alarm can also show live data, and it can be turned on or off. 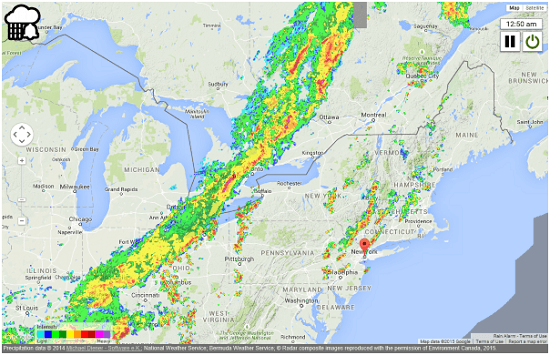 Rain Alarm carries weather data from government weather services of different countries. These countries include a large fraction of the World, like: the USA (includes Alaska, Hawaii, Puerto Rico, and Guam), Canada, Mexico, Russia, Australia, Canada, the UK, Germany, Spain, and many more.